This recipe for Unbreaded Eggplant Parm is a healthier, gluten free version of my Mom’s eggplant parm that’s actually more authentic than the original! It’s made with baked eggplant instead of fried and isn’t coated with any breading. This is actually how it’s made on the Amalfi Coast of Italy, and while I still love my mom’s eggplant Parmesan, this gluten free version hits the spot just the same. Eggplant Parmesan is one of my all time favorite comfort foods. It’s melty, gooey, cheesy and always reminds me of my mom. She made the best eggplant parm ever. 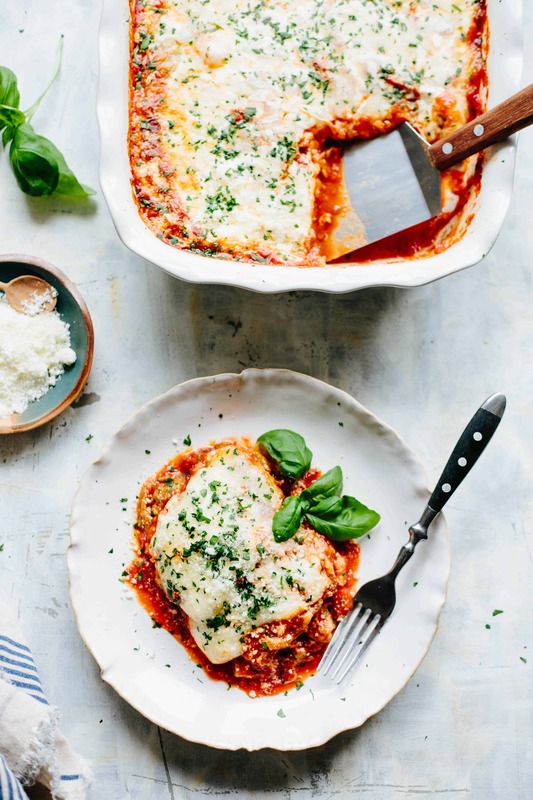 Since my mom was Italian, I always assumed this was the authentic way of preparing eggplant parmesan – breaded and fried pieces of eggplant, layered with marinara sauce and lots of mozzarella cheese, then baked until melted and bubbling. As it turns out, this is really an Italian American adaptation of the dish. They still make eggplant parm – or rather, Melanzane alla Parmigiana – in Italy, they just do it a little differently. Or at least that was the case on the Amalfi Coast. When we were there last October, Eggplant Parmesan was on just about every menu of every restaurant we ate at, and we ordered it a lot. Sometimes it had mozzarella, sometimes it just had a bit of parmesan and/or pecorino. A few times it had ricotta. But not a single time did it have any breadcrumbs. The eggplant was simply flash fried, then smothered with tomato sauce and cheese. I never thought about making it this way at home until I started cutting gluten out of my diet (RIP) a few months ago. I’ve been doing a pretty good job of steering clear of the g-word, and it’s all because of recipes like this one. This eggplant parm doesn’t contain any gluten at all, and yet is still just as comforting and satisfying as my original recipe. Also, because it doesn’t involve the tedious process of breading tons of pieces of eggplant, it comes together way faster. Just like in my Mom’s Eggplant Parm and my Moussaka, this recipe calls for baking the eggplant rather than frying it. It saves so much time, makes way less of a mess, is a little bit healthier and tastes just as good. I honestly don’t know why you’d ever do it another way. I’ll miss the nostalgia that always comes with my mom’s eggplant parm, but this recipe is just as comforting and has plenty of it’s own memories to go along with it. This recipe for Unbreaded Eggplant Parm is a healthier, gluten free version of my Mom’s eggplant parm that’s actually more authentic than the original! It’s made with eggplant that’s been baked, not fried, and isn’t coated in any breading. This is actually how it’s made on the Amalfi Coast of Italy, and while I still love my mom’s eggplant Parmesan, this gluten free version hits the spot just the same. Preheat the oven to 425 degrees and line 3 sheet pans with parchment paper. Brush the eggplant slices lightly with olive oil on both sides, then lay them out in an even layer on the sheet pans. Sprinkle with salt, then bake until golden brown, rotating the pans as needed, about 20-25 minutes. (You may have enough eggplant to make a 4th pan.) Let cool. Lower the oven to 350 degrees and set aside 2 cups of mozzarella and 1/2 cup pecorino Romano. Ladle about 1/2 cup marinara sauce into the bottom of a 9×13 inch casserole dish, then spread it around to coat. Place a single, even layer of eggplant over the sauce, then top with another thin layer of sauce and a sprinkling of each cheese. Continue layering the eggplant with more sauce and more cheese until you’ve used everything up. It’s okay if the final layer of eggplant is a bit sparse. Sprinkle the top with the reserved 2 cups mozzarella and 1/2 cup pecorino Romano. Cover with foil and bake for 30 minutes, then remove the foil and bake until bubbling and slightly browned on top, about 20-30 minutes more. Let cool for at least 30 minutes before serving. Sprinkle with chopped parsley if desired. Leftovers can be stored in the refrigerator for up to 5 days. This recipe will definitely be prepared and making an appearance on a nearby plate [in my kitchen] real soon. No doubt I’m not a hater of fried eggplant, but baked is more healthier and less of a mess. 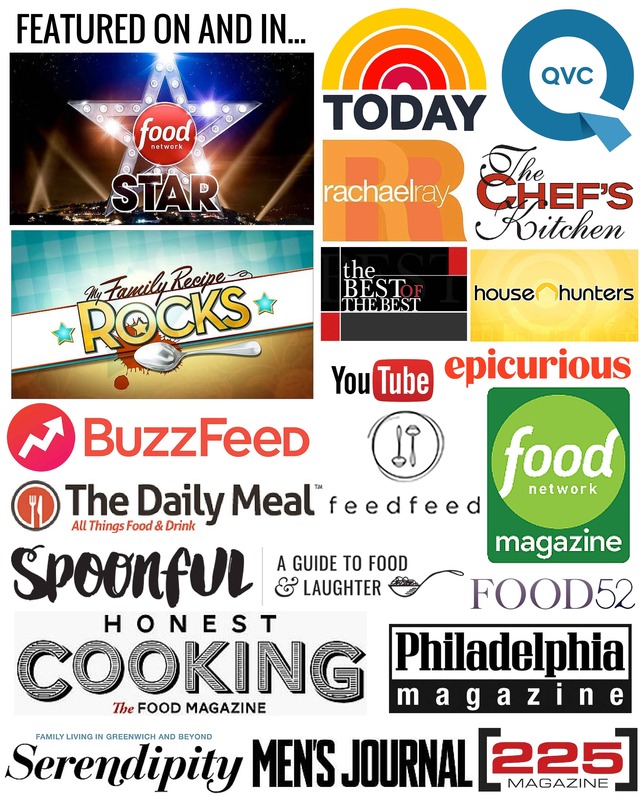 Just two reasons why your insight will become a successful dish for me. Thanks Coley for sharing, always. You’re not just a recipe poster, you have the validating details in a compelling story from a real Jersey girl versus a big corporation with suspect motives. Much respect!